We’re taught as kids the basics behind the life cycle of a frog. If you’ve ever kept them as pets you’ll know that it’s much more difficult than it looks to raise tadpoles. Before a frog is fully developed it spends many weeks growing. It’s a tadpole’s job to search for food to get enough energy to grow. Over time, their appearance will change and its diet will also change. This can make looking after them particularly difficult as you need to keep up with their changing needs. They are best kept by people who are familiar with fish keeping, to avoid any beginner mistakes. It’s important to feed them the right foods at the right time, different nutrients become important as they grow through various stages. Starting life as a herbivore, their diet is quite simple, but as they grow and develop into omnivores things get more complicated. By the time they become a frog their diet will be almost completely carnivorous. 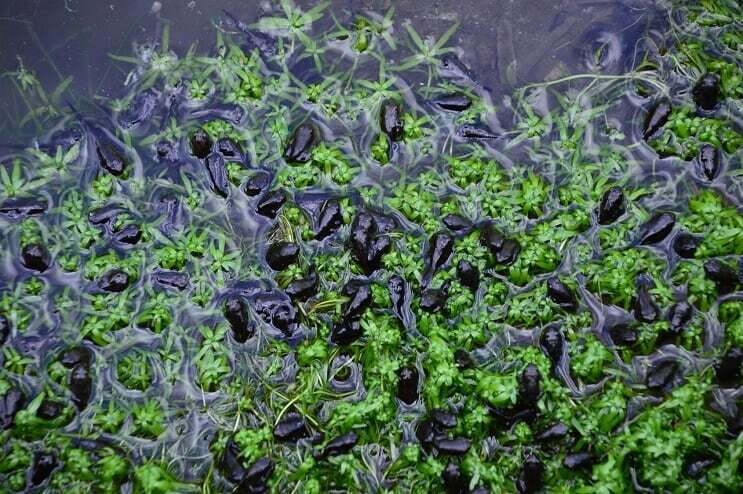 This article will take you through what tadpoles eat in the wild and give suggestions for what you can do to recreate this diet at home. What Can You Feed Tadpoles in an Aquarium? When and How Often do Tadpoles Eat? Most tadpoles are fully aquatic, but there are some that are semiterrestrial (such as the Indirana beddomii). They are most commonly found in ponds and lakes that are surrounded by algae and plants which offer them protection from predators. Different species prefer slightly different environments. Colder species are found in waters ranging from 40-75°F. Keeping water at the higher end of this range will increase their growth rate, but if the temperature is too high then it can be harmful. Like many other freshwater animals, they are omnivores throughout most of their life, meaning that they can eat both plant and animal matter. The range of food available means that we still don’t know everything that tadpoles eat in the wild. However, they do not start life as omnivores. While hatching, they feed on their egg’s yolk sack which is high in protein to help them grow quickly. When the yolk is finished they need to find food themselves. Newly hatched babies are small; it’s hard to find other animals that are small enough to eat so they eat algae. When they’re young, they have a long coiled intestine which is specifically designed for digesting vegetation and extracting proteins and calcium. As they grow they can move onto plant leaves/stems and later on they can manage small insects. Once they are mature tadpoles, they will eat almost anything they can fit into their mouths. This helps them to find as much food as possible, so that there’s more energy available for faster growth. The most common foods they’ll come across are vegetation, dead insects, water striders and sometimes small fish. Their diet changes again as they develop into frogs/toads, and they become almost exclusively carnivorous. In order to keep tadpoles healthy and ensure that they feed regularly, their aquarium needs to resemble their natural habitat as closely as possible. Luckily they can survive in various water parameters, but a pH of 6-8 is ideal along with slightly hard water. 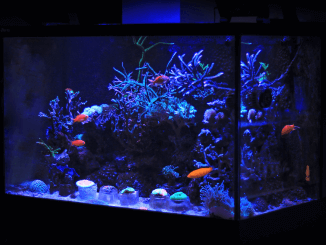 As with any tank, keep nitrates as low as possible. You don’t need a strong current because the ponds they live in are usually still. It’s easier for algae and pollutants to buildup in the water when there’s no movement, so keep your tank clean and do water changes weekly to keep the tank healthy and remove nitrates. 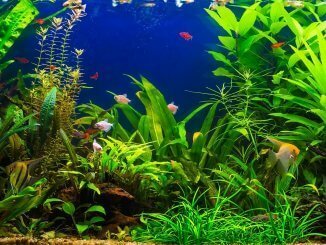 It’s important to add plants into the aquarium as they perform a variety of useful roles. They keep the water clean, act as a secondary food source and also give the tadpoles a safe area to hide. When they have somewhere they can hide they become more comfortable in the tank and less likely to refuse food. They will feed on your tank’s plants so be prepared for them to take some damage. Hardy, fast growing plants, (such as hornwort) will be more likely to survive. Keep an area of the tank above the water’s surface so that they can climb out of the water when they grow legs and start showing semiterrestrial behaviors. You can use large rocks or an area of substrate reaching above the surface of the water, like a shoreline. If you use rocks, make sure they are secure and unlikely to move when they move on and off. As frogs they obviously jump, so you might want to keep the water level low and use a deep tank. The food you feed them depends on their maturity. Babies will be happy with store bought fish foods, especially flake foods because they’re easy to break up. Some stores sell foods made specifically for tadpoles. While getting food from stores is convenient, there’s plenty you can use to feed them with in your home. You can find many recipes online for homemade fish foods, or simply adding uncooked vegetables into the tank will be popular. As they get older, the size of the food can increase, so you can start introducing larvae and dead insects to their diet. If these new foods go uneaten then they might not be ready, just try again the following week. Start introducing these foods when they’re around 3 or 4 weeks old. They can vary in size depending on the species, so it’s better to use age to judge when changing their diet. Regularly switching up their food keeps feeding times interesting, while giving them all of the nutrients they need. 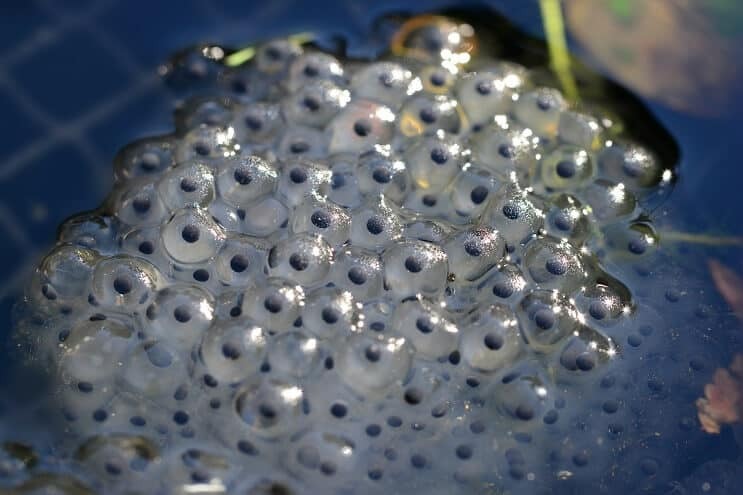 Protein is an important resource for growth, so it is particularly important for tadpoles because they are growing throughout their lifespan; from hatching to metamorphosis (turning into a frog/toad). Feeding them animal matter will give them the protein they need. Easy ways to do this are through bloodworms and aphids, but any small insects will do. Don’t add any meats into the tank that they wouldn’t come across naturally (such as farm animals) because it will be hard for them to digest. Protein is most important while they develop legs (5-9 weeks). During this time, gradually add more animal matter to their diet to ease them into the carnivorous frog lifestyle. One hour after feeding them, check the tank again to see if all the food has been eaten. If not, scoop the leftovers out to prevent it from decaying and polluting the water. Your tadpoles will need to be fed regularly. Since they’re growing they’ll always be searching for food; one feed session every day will keep them healthy. Some people suggest that you should feed them every other day, but in larger amounts. This is not great advice because they won’t be able to eat all of the food and the excess will just sit on the bottom of the tank and decay. If any food is left in the tank an hour after feeding, then you are probably over-feeding them. Remove the excess food to keep the water clean. There is no set amount of food to feed them, since different people use different foods. One pinch of flake food is enough to keep them happy, use this to judge the amounts of other foods. Watch how much they each and adjust the amount you feed them accordingly. A regular routine isn’t essential. Their main purpose in life is to eat, so that they can grow. This means that they will always be on the lookout for food regardless of when you add it to the tank. Once they have sprouted arms you can hold off on the feeding for a while. They will start to absorb their tail for nutrients, you will notice it begin to shrink. Start feeding them again when the tail has nearly disappeared. You can continue to feed them fish flakes, live and frozen foods, or any of the foods on the list above. A tadpole isn’t a permanent form; it is just a stepping stone from egg to adulthood in the lifecycle of a frog. 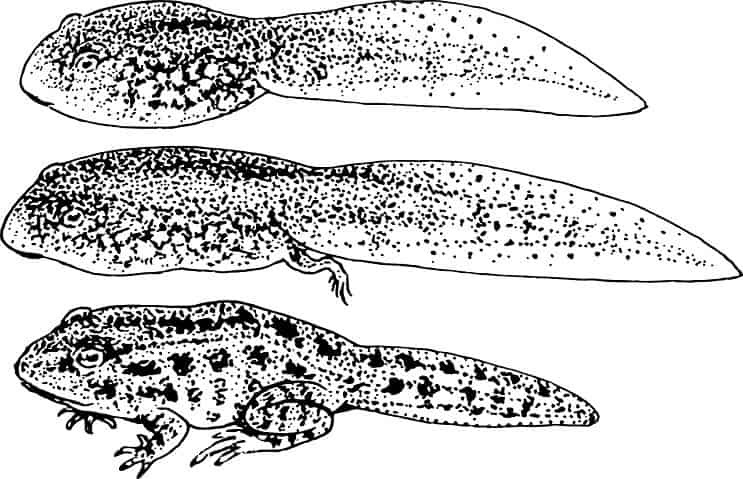 Food and hormones are the main drivers for tadpole development. There is some degree of consistency between development times, but species, water quality and nutrition all play a big part. A frog begins to develop through the process of metamorphose, but how does this happen? As time goes on, they change. An easy way to understand this is by thinking of them undergoing their own small lifecycle, before reaching frog status. They usually start to hatch in the spring, but the biggest populations will be found in summer. A newly hatched tadpole will latch onto plants (where it’s safe) and eat any leftover yolk from their egg. At this age they are very vulnerable to the elements and predators, to an extent where many of them will die. Those that reach ten days old will begin swimming around, looking for more food now that the yolk has run out. Their diet will be strictly herbivorous, and they won’t swim far from the safety of the plants. By three or four weeks old they will start to lose their gills and grow small teeth. These teeth now allow them to eat bigger and harder foods. Through week five to nine, they will start eating insects alongside the plants. Their organs will have grown longer, providing a bigger area to digest nutrients. It’s around this time that little limbs start emerging while their head and body grow to accommodate them. They now look like frogs, but they’re smaller and have a tail trailing behind them. At week twelve they are much bigger. The tail is now gone, it has been digested for nutrients. 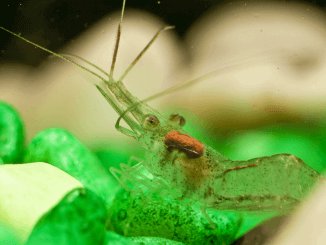 They can leave the water and start hopping about on land (or the rocks in your tank or pond). This is the final stage of their life cycle. From week thirteen onwards they are now frogs. It’s now their job to go and lay eggs in the water themselves, completing the life cycle of a frog. By now you should know that the foods you give to your tadpoles will change based on their age. Plants and algae are ideal for newly hatched babies, while older species can enjoy animal matter such as worms and insects. Though their dietary needs can seem intimidating, they eat similar foods to fish, and lots of the food can can be found in your home. 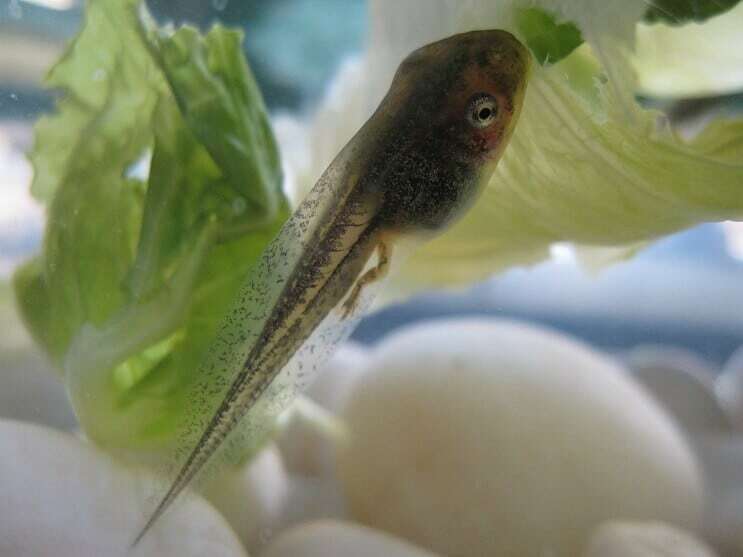 It can be a lot of work to raise healthy tadpoles due to the regular changes to their diet, but once they have grown into healthy frogs you’ll realize that all of the work was worth it.